Oceania Curator Polly Bence talks about her work with the UK’s Kiribati community through the Object Journeys project, helping to bring the British Museum’s Micronesia collection into focus. Kiribati Object Journeys project partners develop design and interpretation ideas for the new display. When I was asked back in 2014 to start thinking about the upcoming Object Journeys project, my mind immediately turned to the possibility of bringing the British Museum’s Micronesia collection in to focus. The Department of Africa, Oceania and the Americas has close links with some of the members of the Kiribati Tungaru Association (KTA) and, together with the Object Journeys Partnerships Manager Kayte McSweeney and Oceanic Curator Julie Adams, we decided to reach out to the UK’s Kiribati community. The Republic of Kiribati (pronounced Kiribas) is an island nation that straddles the equator and is situated between Australia and the Hawaiian Islands. 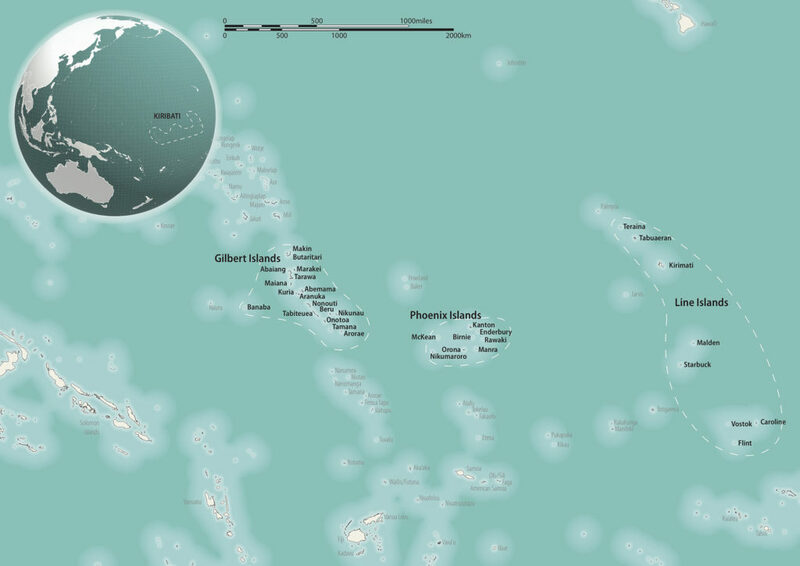 A group of 16 of these islands were once known as the Gilbert Islands and were part of the British colony the Gilbert and Ellice Islands, for a little over 100 years from the late 19th to the late 20th century. Taking three flights and almost 30 hours to reach the islands from the UK, Kiribati is made up of 33 islands and coral atolls dispersed over 1.3 million square miles of Pacific Ocean. Today more than half of the 112,000 population live on the island of Tarawa and over recent years people have relocated to Fiji, Australia, New Zealand and the UK. The Gilbert Islands gained independence from the UK in 1979 and the Republic of Kiribati was formed. The newly formed Republic included the Line Islands and Phoenix Islands which lie to the east of the Gilbert Islands, as well as Banaba or Ocean Island, which lies to the west. Map of Kiribati. © Mark Gunning, courtesy Museum of Archaeology and Anthropology, Cambridge. The Kiribati collection at the British Museum is largely made up of objects collected during this period of the islands’ history. From dance ornaments to coconut fibre armour and everything in between the Museum looks after almost 600 objects from what were then called the Gilbert Islands, as well as objects from modern-day Kiribati. This growing collection offers insights into the material culture of this island nation. Objects like baskets and fish traps are not only practical, made with a deep knowledge and skill of local materials but they are also very beautiful, delicate and artistic. Dance ornaments and garments show how people celebrated the art of dance, performance, storytelling and song. This tradition continues today and the I-Kiribati are well known and greatly respected for their dancing. Model canoes, canoe ornaments and the many fish hooks in the collection demonstrate a thorough and historic understanding of the surrounding Pacific Ocean, how to travel between islands and what it takes to thrive in this environment. 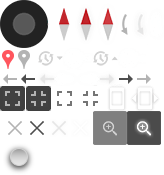 These objects survive as testament to the sophisticated navigators of days gone by. Before setting sail in the fair weather season, a Gilbertese mariner will sometimes spend several days looking at the sea. If it is streaked in places with calm patches of an oily appearance he will refuse to start until these disappear, for they speak to him of strong currents. When visited by a squall of rain between islands, or when travelling by night with only a sense of direction to guide him, the sailor observes the waves. If these suddenly change in direction he knows that land is near. 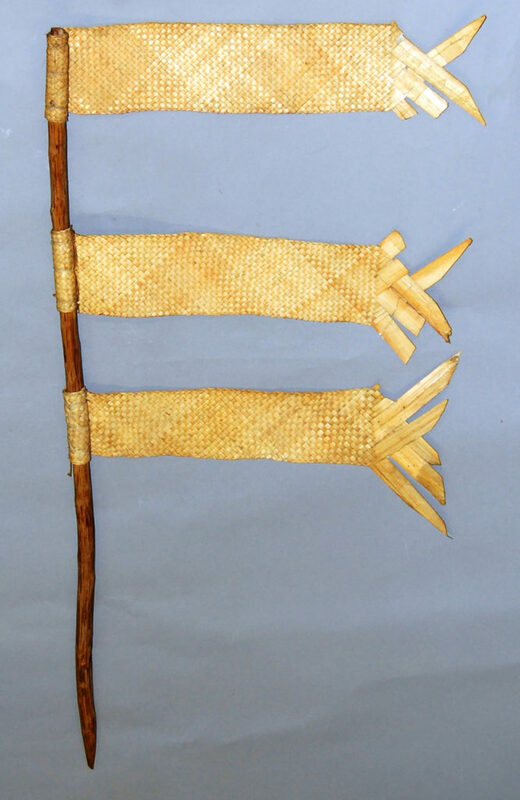 Canoe mast or pennant made of wood, pandanus leaf and fibre. Donated to the British Museum by Sir Arthur Grimble in 1921. Unique to these islands is the incredible defensive armour made of coconut fibre. When worn with a helmet made of porcupine fish and a waist belt made of porcupine ray skin, the Gilbertese warrior was a formidable sight (albeit fairly immobile). Practised historically across the islands, one-on-one battles as well as intense group warfare took place over land and resources – and with solid and fertile land at a premium it’s not hard to imagine why. The collection houses 48 different pieces of armour and a multitude of weapons lined with rows of shark teeth. This art of warfare is no longer practised on Kiribati and ceased with the introduction of Christianity in the mid-19th century. Another manufacture worthy of being noted is a very singular suit of defensive armour, consisting of corselet, trousers, armlets and cap all made of cocoa-nut fibre. The corselet is a very fine piece of workmanship. 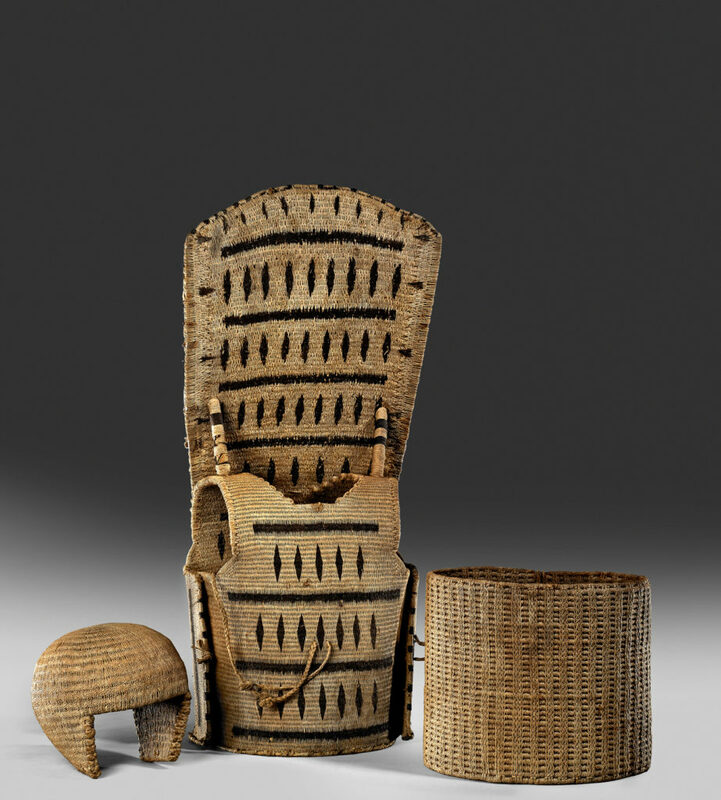 Helmet, cuirass and waist-band made of coconut fibre and human hair, collected Charles Richard Swayne, Resident Commissioner in the Gilbert and Ellice Islands, before 1895. No objects from the Kiribati collection have been on display at the British Museum since the exhibition Pattern of islands: Micronesia yesterday and today in the 1980s at the Museum of Mankind and the Object Journeys project is a fantastic opportunity to showcase some highlights of this wonderful collection onsite in Bloomsbury for the first time. The earliest object from the Gilbert Islands to be registered into the collection was a piece of armour – a coconut fibre cuirass in 1848, and our most recent acquisition is a dance costume made in April 2017 by a practising I-Kiribati artist. This costume is on display in the Object Journeys Kiribati case in Room 24. The black raffia skirt on display was donated by Chloe Karea, one of the members of the group who curated the display. In the Oceanic section we don’t often get the opportunity to work for an extended period of time with a community group, and certainly have not focused on the Kiribati collection before. It has been a real privilege for us to meet members of the community who have tangible experience and knowledge of living in the islands. Some members of the group were born and raised in Kiribati while others are second or third generation I-Kiribati and all have spent time on the islands. 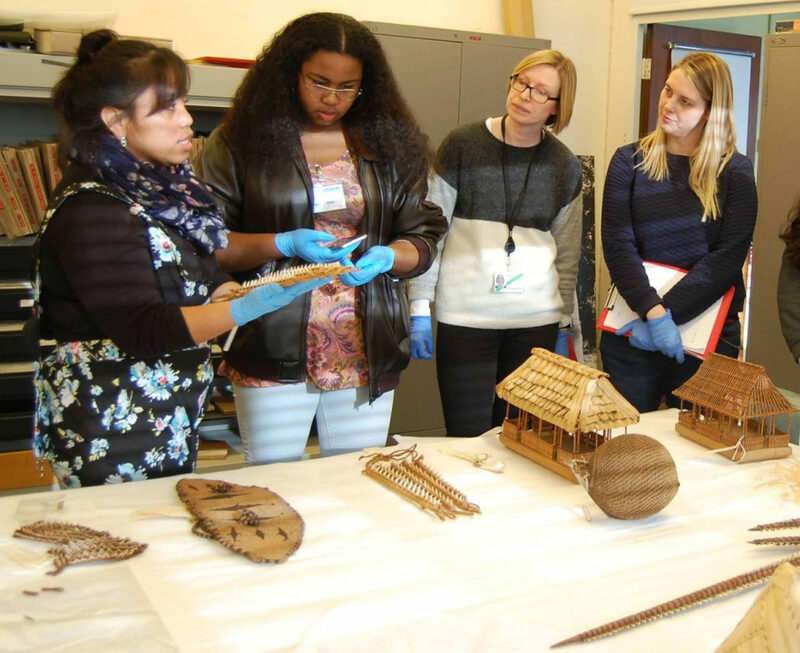 Object Journeys project partners explore the Kiribati objects in the Museum stores. The Republic of Kiribati is so vast, as well as being many thousands of miles away from the UK, and it is easy to make sweeping generalisations and believe that you understand the landscape (or in this case, seascape). After exploring various themes and narratives with the group, we now have a clearer understanding of Kiribati as a place, its location in the world, what the challenges are, and how these affect people living there on a daily basis. We have learnt that it is near impossible to speak in one voice as there are many nuances between the islands. The Object Journeys group have chosen themes that speak to all the islands rather than pick out specific objects which might only represent one or two islands. This is itself a difficult task, but one that has been achieved with much consideration, respect and careful thought from the group. We have also learnt that people living in Kiribati continue to be adaptable and resourceful, and absolutely nothing goes to waste. Resources are scarce on the islands and the coconut tree is utilised for all that it can offer – the wood, shell and coconut fibre is prepared and turned into cordage which is used extensively. The pandanus plant is another resource that is used in its entirety and in many ways, especially in dance costumes. although the inhabitants acknowledge the reality of the constraints if their land, their symbolic conception of the environment and their skill at making the best use of it allow them to live in harmony with their surroundings. With only a small variety of plant species (compared to those provided by a continental or volcanic island), they transform all the usable parts of the plants, exploiting them for food as well as for utilitarian and medical purposes. Historically shell valuables were traded and exchanged with neighbouring islands as a way to source rare materials, foster relationships and ensure survival. Pearlshell is not widespread throughout Micronesia and therefore shells found on adornments like this neck ornament are extremely valuable and are likely to have been imported from elsewhere. Pearlshell, pandanus leaf and coconut fibre neck ornament. Purchased from the collection of John Spencer Noldwritt in 1891. Collaborating with the Kiribati community group has been an eye-opening journey and we have been privy to subjects that are difficult to talk about, such as the increasing tension between the land and the encroaching ocean. Necessary for everyday survival, people are faced with the monumental challenge living life surrounded by rising waters and with that, the very real possibility of the loss of more land. The only nation to bestride all four hemispheres – north, south, east and west – the Republic of Kiribati in the centre of the Pacific could be considered to be at the heart of the world. And in this new century, at the heart of the world’s concerns. 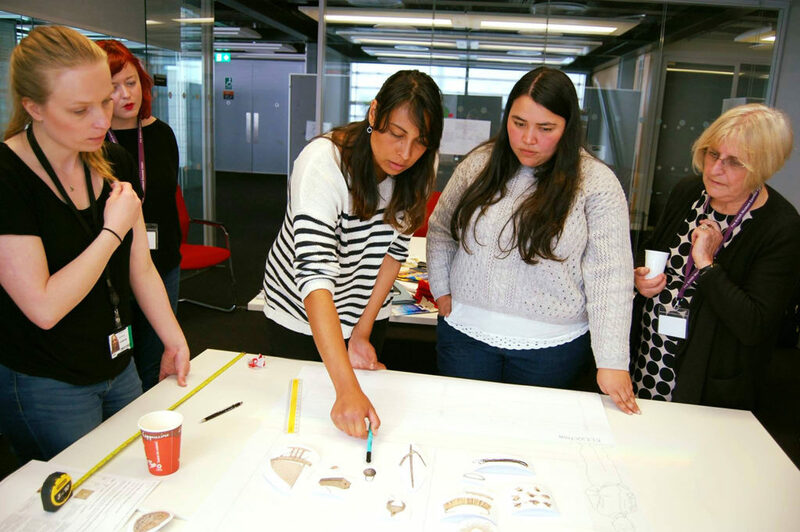 Object Journeys project partners develop design and interpretation ideas for the new display. 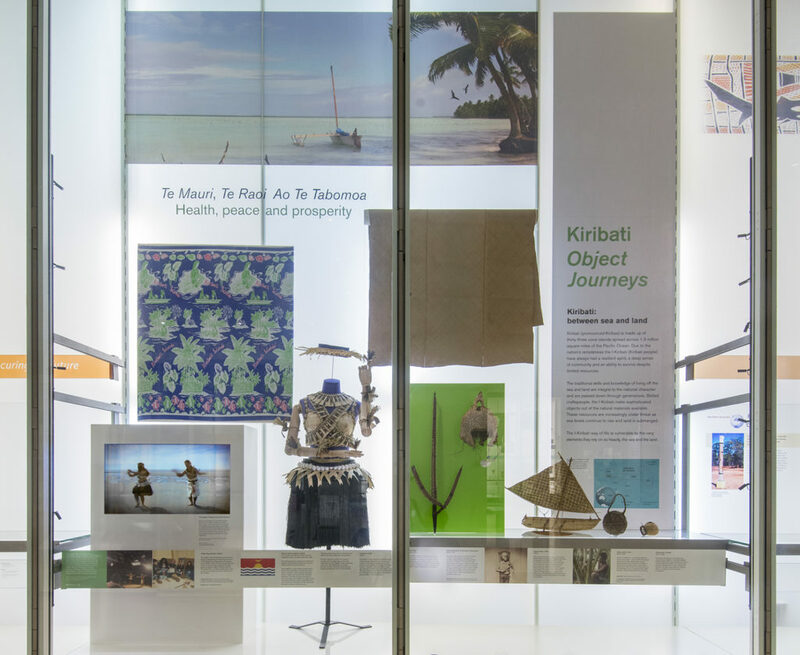 The community group’s first-hand experience has been invaluable for curating and producing a display of Kiribati material and we are thrilled to have had this opportunity to work with them and learn much more about the Kiribati objects in our care. Objects on display in Room 24. Object Journeys is a community collaboration project at the British Museum and with three UK partner museums that is supported by the Heritage Lottery Fund. The three-year project will support community partners to research and explore museum collections, and to work collaboratively with museum staff to produce displays, events and digital content. Find out more on the Object Journeys website.